I wasn't able to make the last Seattle Sketchcrawl, but I have recently done a sketch from the Convention Center. 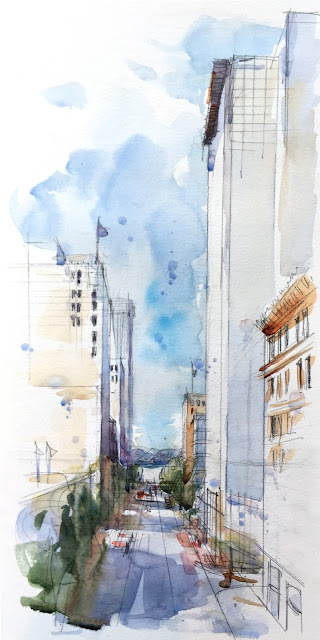 This summer, I taught a quick workshop as part of the Northwest Watercolor Society's anniversary celebration activities. I walked a pretty large group up to this spot on the top floor, then turned and sketched the view out the window. It was a super quick demo, but good for explaining the eye level and how the vanishing point works in sketching urban streets. Most of the NWWS folks are studio painters, so urban sketching was new to most of them! I snapped a quick photo of the sketch before giving it to one of the workshop participants, who also took one of my Good Bones workshops, and traveled all the way from out-of-state. Thank you! Great use of light washes. I especially like your sky. Lovely, Stephanie. I like the contrast between the angular lines and the soft watercolors. Thanks Frank, Logan, and Jane, for your very nice comments! It was super quick, so the watercolor was sloppy...I really wanted to show studio watercolor painters that yes, it's OK to do sloppy painting!